From our efforts to encourage young Australian agricultural students and researchers into further study, careers and volunteering in agriculture for development, we have had some wonderful outcomes. Recently we reported on a young group of University of Western Sydney students who managed to meet the right people at our annual conference which led to an exciting opportunity to visit and learn about agriculture in the Solomon Islands. We now have some of our former conference scholars sitting on the State Committees of the Crawford Fund, to assist us in decisions such as around the training we support. In addition, we have a former scholar and volunteer joining us in our representations to the current Joint Standing Committee on Foreign Affairs, Defence and Trade’s Inquiry into the role of development partnerships in agriculture and agribusiness in promoting prosperity, reducing poverty and enhancing stability in the Indo-Pacific region. There are also Young Crawford groups in some States made up of former scholars and members of the Researchers in Agriculture for International Development (RAID). And we have reports of scholars going on to volunteer or further their academic or work careers around food security issues. Our most active Young Crawford Group is in Tasmania, which has been meeting regularly in Hobart at the University of Tasmania for some years now. 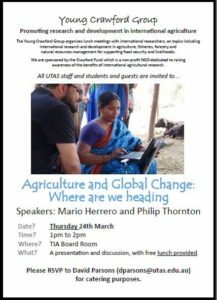 Their next event is on Thursday the 24th of March at which presentations will be made on ‘Agriculture and Global Change: Where are we heading?’ See this notice for all the details. And our Young Crawford Group in Tasmania have now spread north! A small group of researchers gathered at the Tasmanian Institute of Agriculture in Launceston earlier this month for the first meeting of the Tasmanian Young Crawford Group for 2016. Attendees also included two members of the Tasmanian branch of the Crawford Fund and six John Dillon Fellows from Myanmar, Vietnam and Pakistan. Morning tea with the Tasmania Branch of the Crawford Fund, the John Dillon Fellows and others interested in establishing a Young Crawford Group in Launceston. Back L-R: Georgie Pengilly (UTAS), Laurie Bonney (UTAS), Tran Minh Tien (Vietnam) and Aamer Irshad (Pakistan). Front L-R: Thandar Nyi (Myanmar), Geoff Dean (UTAS), Aung Aung (Myanmar), Stephen Ives (UTAS) and Bob Reid (Crawford Fund). Dr Stephen Ives presented an introduction to Tasmanian Agriculture for the international guests, and then facilitated a discussion forum on the synergies of domestic and international agricultural research for development. 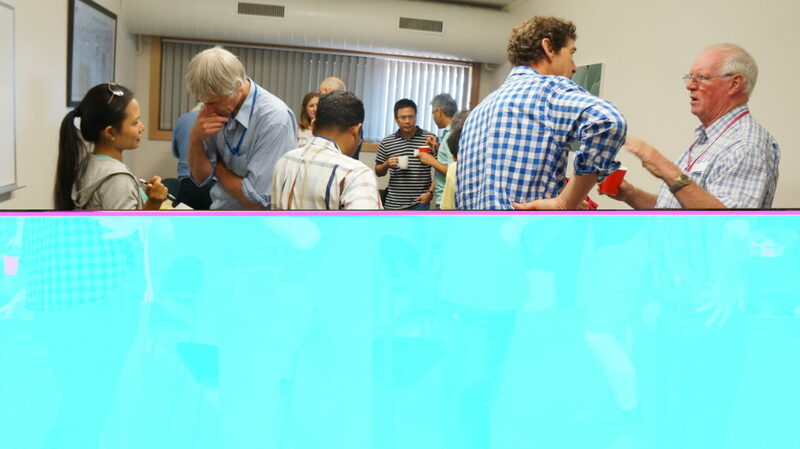 Following the discussion, light refreshments were served enabling networking and linkages to be established. The Fund also holds a range of events with RAID who will again be part of our scholars’ activities for our 2016 conference. For previous articles and blogs from and about our past Crawford Fund Scholars, click on the links below.